I know I have spent lots time on this subject. We continue to be barraged by academic types with pencil and paper that think we can maintain our way of life using "renewables". I am challenging this illusion that we can maintain BAU with “renewables” both at the level of needed energy and without further devastation of the environment (our true life support system). When looking at the constraints to solar pv (actually all “renewables”) there are many ways to approach it. Included, but also standing alone, is the enormous environmental degradation (water, air, soil, biological diversity) associated both with the making of the infrastructure, the operation of the infrastructure and the making of the materials that go into solar and wind devices. In addition, the solar and wind devices do not stand alone, they have necessary supporting hardware – inverters, controllers, batteries, cables, monitoring instrumentation, etc – that will not last 25 years and must turn to the fossil fuel supply system to replace the supporting devices. http://sunweber.blogspot.com/2013/10/a-small-fan.html These auxiliary equipment manufacturing have water and environmental consequences also. 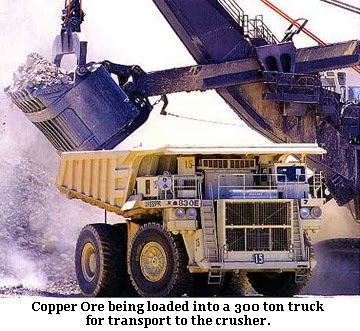 Because renewables will never replace themselves as a horse or oak tree does, once they need replacing including the auxiliary support equipment there will not be the fossil fuel energy to accomplish this especially if it is 25 years down the road. Even if the solar and wind devices could generate enough energy to replace themselves (and the required infrastructure) they will then need more excess energy to build the equipment that we want to have the electricity for in the first place (radios, vacuum cleaners, water pumps, etc.) Not going to happen. Given the above “renewable” devices are not green, are not “renewable” like the sun and wind, and are not sustainable. Given the above, with the reliance on fossil fuels to build the infrastructure and then generate the materials to create the devices to capture the sun and wind, so-called renewables support fracking, tar sands, deep ocean drilling and mountain top removal for coal. What happens when the EROI gets too low? What’s achievable at different EROIs? If you've got an EROI of 1.1:1, you can pump the oil out of the ground and look at it. If you've got 1.2:1, you can refine it and look at it. At 1.3:1, you can move it to where you want it and look at it. We looked at the minimum EROI you need to drive a truck, and you need at least 3:1 at the wellhead. Now, if you want to put anything in the truck, like grain, you need to have an EROI of 5:1. And that includes the depreciation for the truck. But if you want to include the depreciation for the truck driver and the oil worker and the farmer, then you've got to support the families. And then you need an EROI of 7:1. And if you want education, you need 8:1 or 9:1. And if you want health care, you need 10:1 or 11:1. Continuing down the path of proselytizing for “renewables” is simply more of the same – business as usual under a high tech guise. It creates a false hope that will trap us further. It really is ethnocentric from the point of view of the so-called developed world because that family in Bangladesh will not be getting their pv panels any time soon. We must work towards an energy use not high tech at all. The longer we wait to accept the truth, the more devastating will the consequences be environmentally but especially socially and psychologically. Here are examples of the equipment needed to mine the materials for solar and wind devices. 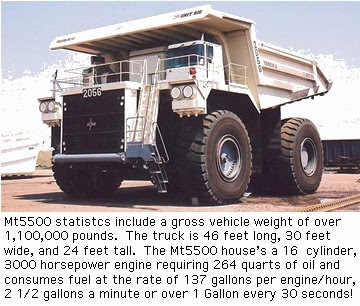 Look at the fuel use on the diesel/electric truck.